Postta Pre-made All-in-One BNC Video and Power Security Camera Cable with 2 Type Connectors. Cable just for Camera with DC Power and Supply DC Power for Security Cameras. Bare Copper Conductor make Video Signals more Stable. High Quality Plug and Play Ready Connectors on both ends Make the Cable Easier to Use. Two Type Connectors can Give You more Choice at the Wiring Distance. Fit for CCTV cameras, DVRs, and Audio Video Systems,Compatible with all CCTV Surveillance DVR Camera system. 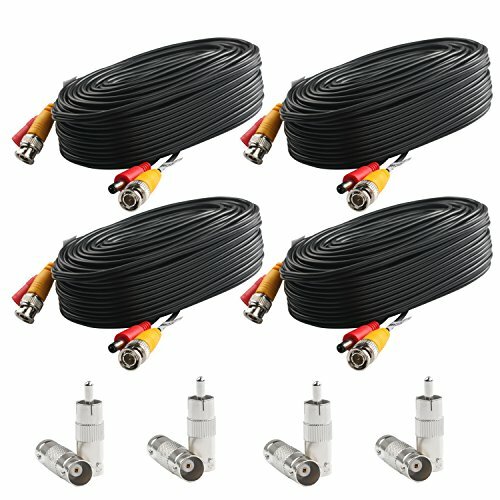 4 Pack 60 Feet Pre-made All-in-One BNC Video and Power Security Camera Cable with 8 Connectors (4 Pcs BNC Female to BNC Female Connector,4 PCS BNC Female to RCA Male Adapter). The cable just for Camera with DC Power and Supply DC Power for Security Cameras. Bare Copper Conductor make Video Signals more Stable. High Quality Plug and Play Ready Connectors on both ends Make the Cable Easier to Use,And Two Type Connectors can Give You more Choice at the Wiring Distance. 45P PVC Molding and High-Quality PVC Material make the Cable more Durable. Gold-Plated Core can Minimize Interference and Ensure Optimum Signal Transfer. If you have any questions about this product by Postta, contact us by completing and submitting the form below. If you are looking for a specif part number, please include it with your message.